Yesterday I hopped on the treadmill to do those daily miles and happened to turn on the last forty minutes of Miss Potter, the sweet little film about Beatrix Potter’s love life. Really, what can anyone know about Beatrix Potter’s love life? I expect that there are biographies out there. But from what I saw of the film, she was passionately in love (in that naughty here’s-a-peek-at-my-ankle Victorian way) with one of her publishers. Then, in the space of that forty minutes, he died of consumption, she bought Hill Top farm in the north country, and eventually married her lawyer. Renee Zellweger did a lovely job portraying Potter: gentle but serious, hopeful, dignified. Ewan McGregor–well, I don’t know what he was doing in the film. So earnest, but a little dull. I liked the clever animated sequences of Potter’s several characters. In fact, the sequences in which they all seem to run away, deep into the world of their pages in fear reminded me why I’m drawn to her books. I wasn’t exposed to Potter’s work as a child. My mother bought a complete set for Pomegranate when she was small, but I read them to her. The stories are so removed from so much of the pablumized dreck that’s out there for children now. Yes, there are many, many fine children’s books–but few picture books take on the darker side of life. Potter’s creatures are frequently endangered. In many of the stories I can recall, they risk death as they try to feed themselves or reproduce. Some are predators, some are prey. 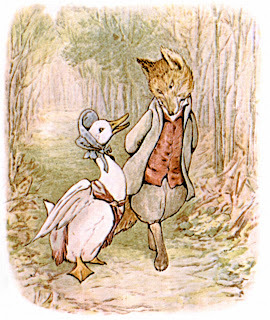 Me, I always admire the predators: Simkin, the wicked cat in The Tailor of Gloucester, Old Brown the owl in Squirrel Nutkin, Foxy Mr. Tod who covets Jemima Puddleduck’s eggs, the hungry trout who tries to gobble up Jeremy Fisher. Potter seemed to have a farmer’s understanding of the order of nature. I know it’s a kind of nutty question, but do you have a favorite Beatrix Potter story? I would have to say mine is The Tailor of Gloucester. All this is very well, but the point I really wanted to get to here is about Daniel Craig. (Fellow writer Amanda Stevens occasionally has Clive Owen Wednesdays on her blog, but she hasn’t had one in a while. I felt obligated to pick up the slack in the updates on ruggedly handsome actors category!) When I went to imdb.com to check out the Zellweger film, I clicked on Ewan McGregor’s name. I discovered that he’s starring with–you guessed it–Daniel Craig in a film called I, Lucifer. Has anyone read the Glen Duncan novel on which it’s based? In it, Lucifer apparently gets a chance to redeem himself by living a well-behaved life in the body of a depressed writer. Hm. Doesn’t matter what it’s like, though. I’ll see it if it’s just Daniel Craig running around in a bright red union suit with a moustache painted onto his handsome face! Oh, I expect I could work a Daniel Craig association into just about anything–but I swear this one was totally accidental! I found the song! It’s by Miriam Stockley, and here’s a link to the music on YouTube. A weirdly moody choice for the Beatrix Potter stories, but perfect. Thanks, honey! The link isn’t clickable, but I was able to cut and paste it. Such a gorgeous video. She’s gotten a lot of mileage out of a seventeen year-old song! Oh, Daniel Craig is so yummy! My favorite Beatrix Potter was The Tale of Two Bad Mice. Becky–What a great pick! I always wanted to live in a dollhouse. Maybe that’s a little creepy…? Ditto The Tale of Two Bad Mice. I would have dearly loved to have a dollhouse as a child. No matter how many times I read that story I’d get so mad with those mice. I used to wish for Lucinda and Jane to come to life, banish the mice and properly claim their home. I read your interview at TextyLadies today, Danielle. It was so much fun! The site gets you to a tour of a silent film actress’s astonishing doll house–We saw it when I took the kids to Chicago last spring. Amazing! When we’re old, we should all have dollhouses of our own. Or maybe we’ll just write stories…. I’m all for anything with Mr. Daniel Craig — oh my! I haven’t seen the Beatrix Potter movie — I like Renee Z. in lots of things so it’s good to hear that she did a good job in this one. I especially enjoyed when she went goth for that nutty Jack White! I’m glad you enjoyed the interview. Jane is lovely and her books are great reads. I plan on getting over to America one day in the not too distant future and that museum is now on my list of things to see while I’m there. That is one amazing dollhouse. I’m quite fond of the Tale of the Fierce Bad Rabbit.